This building is one block from the the largest construction project in the history of coral gables, the plaza, a $660 million dollar development, including a 5 star hotel, two condo towers, a class a office building,restaurants and retail. The buildings close proximity to this project makes the location extremely desirable. 255 university drive is a 2 story building with elevator. The first floor consists of 5,287 sq. Ft. And the second floor 5,158 sq. Ft. The first floor is leased to a medical center for 5 years, with option to renew. The second floor is leased to a mental health center for 3 years, with option to renew. Both leases are nn. The building has 17 private parking spaces and is bordered by 34 municipal spaces. This coveted location will only appreciate in the years to come. Coral gables' most outstanding opportunity for developer on biltmore way, the park avenue of coral gables! Existing 12 unit apt bldg, pool & 12 pkg spaces, in mint condition & 100% leased. The zoning district is mf-2 multi family high density & has site specific regulations. Lot is 12,000 sq ft. W/med bonus, 20 units max density. Far of 18,000 sq ft w/med bonus. Max height allowed is 72' w/med bonus which equals 7 stories. Plans available for one of the options & survey. Call for info or appointment. 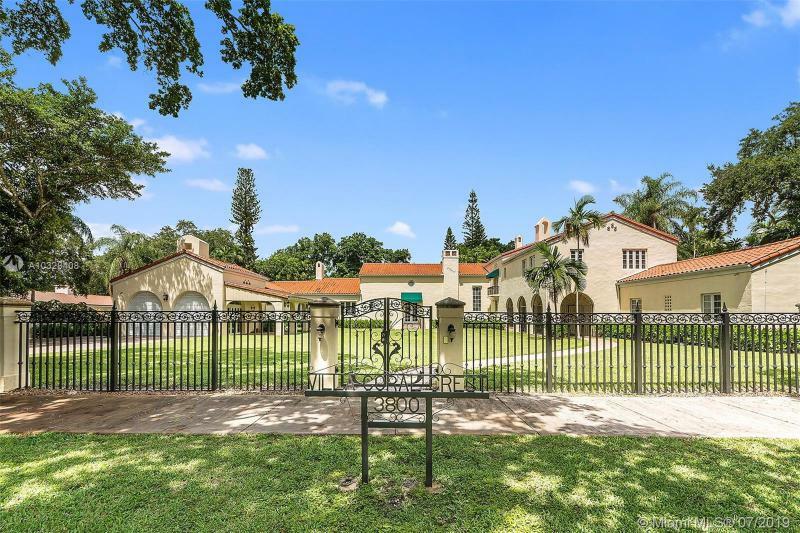 Grand estate on prestigious biltmore golf course in the heart of coral gables! This mediterranean estate sits on an expansive 24,400sf golf course lot with lush gardens inspired by the south of france & boasts over 10,000sf of total construction that includes: large master suite wing with separate sitting area & bonus room, gym, office, securitized wine cellar, fireplace, grand staircase, wiring for surround sound, wood beams + marble & mahogany wood floors. Solid construction with poured concrete walls, impact windows & generator. Exterior features inc a lagoon pool w/waterfall feature, outdoor kitchen with commercial grade equip fit for a caterer + separate air-conditioned multi-purpose room & multiple outdoor cooling units. Making it an ideal property for any form of entertaining! Casa mariola is a state-of-the-art home in the prestigious coral gables that will transcend architectural design for years to come. This brand new house designed by roney mateu sits on an extra-large 16,800 sq foot lot and showcases 6,500 sq ft of architectural excellence. It features a total of 5 bedrooms (plus a theatre room/den area), and 6 full and 2 half bathrooms and will be delivered elevator-ready. The house has a pool, library, and rooftop deck with magnificent views of the biltmore hotel and golf course. Priceless historical landmark designed by george merrick's uncle, denman fink & located 5 blocks from the biltmore hotel & golf course. 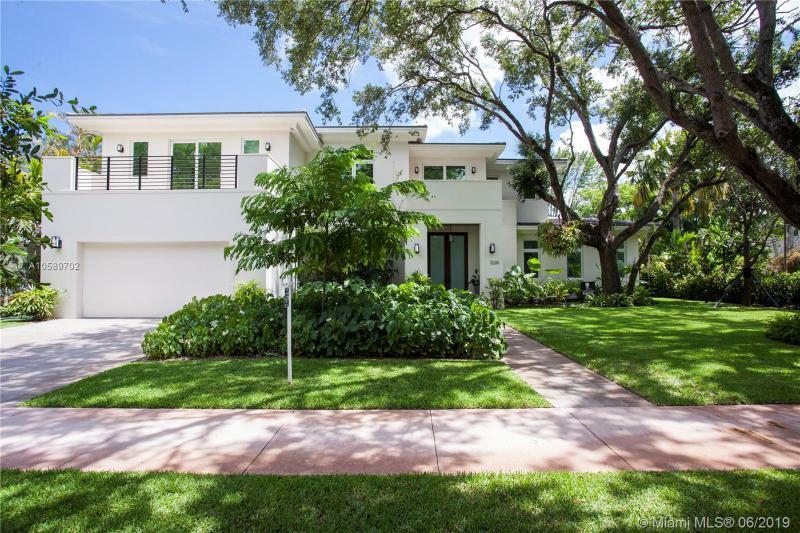 This beautiful corner property w original historical faade, is nestled on 1/2 an acre in coral gables' golden triangle. Florida white pine cathedral ceiling enhances the oversized, grand living room which has the distinction of fossil coral rock that was taken in large rare sections from the bottom of the venetian pool. Entertain your guests in the formal dining which opens onto a charming al fresco courtyard or outside by the pool. Spanish tile, hardwood floors, arched windows and romeo & juliet balcony are just a few of the original details which have been preserved in this 6 bed, 5 bath home. A unique opportunity to own a piece of coral gables history. Brand new and breathtaking! Where lifestyle meets luxury and the location is perfect! This spectacular masterpiece offers understated elegance along with great outdoor and indoor space for fabulous entertaining. A seamless blend of classic contemporary and tropical modern design. 5/5/1, a cooks dream kitchen and master suite to please the most discriminating buyer. Dramatic 10 ft custom double entry doors and gracious foyer open to the 40 ft pool and covered outdoor loggia/dining terrace. Mature trees and lush landscaping provide complete privacy. The location is within minutes of merrick park and shops & fine dining on miracle mile. Located 2 short blocks from the biltmore hotel, golf course & spa on a quiet picturesque coral gables street. Buyers will fall in love! Historical style & modern comforts intersect overlooking the biltmore golf course, this inspiring gated residence is sure to amaze you with its masterfully planned living spaces. Built in 1924 and situated on nearly an acre, spanish influence is found throughout and volume ceilings, renaissance-style double doors and stunning hardwood floors enhance the residence's appeal. The interior boasts 7 bedrooms, 5. 5 bathrooms, grand formal living room with 20 ft coffered wood ceilings, formal dining room, library, sun porches, antique lighting fixtures, 3 fireplaces and a modern kitchen featuring top appliances. The 7882 sf split floor plan offers a private wing for residents, as well as a guest suite in the north wing. Catch this spectacular coral gables 6,000 sqft mansion. Nestled on famous granada blvd. In process of being completed. Contact listing agent for a personal showing. Options are available while work is in progress. 6 bedroom (including maid quarters)5. 5 bathrooms including cabana bath. Oak floors / 5 new ac units / impact windows & doors.